"The addition of a byRemote solution in our restaurants has increased our sense of urgency in our drive thrus. Being able to see the line of cars pulling up to the order station creates an environment of awareness to our staff which enables us to go to peak operational mode quicker than waiting for the stack to occur at the window." The Managed Video Data Center is a new video recording product that byRemote lauched recently. It meets the need for customers who require off-site video storage for a larger number of cameras that are located in a larger number of remote locations. This might be a restaurant chain, a motel chain, or any company with a large number of locations. 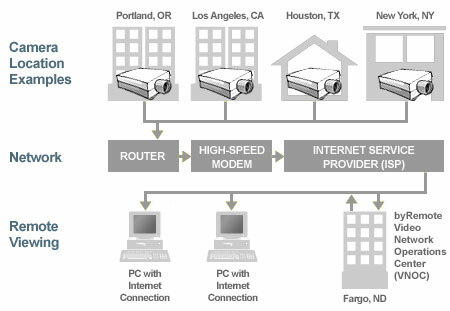 With the Managed Video Data Center, a server has the Video Surveillance Center software installed on it. This instance of the Video Surveillance Center is then used solely to record the video from your cameras. In addition, with the Managed Video Data Center, the standard user interface of the Video Surveillance Center software can be re-branded with your company's logo, color scheme and support information. The Managed Video Data Center service is available as a low monthly subscription plan based on the Managed Surveillance Services provided. You may up-grade or down-grade your plan whenever you wish and there are no contracts. The Managed Video Data Center subscription fees are on a month-by-month basis. On-going HelpDesk support by phone, email and on-line. Notification by email should the video storage server go off-line. Notification by email should any of the cameras go off-line. Video Surveillance Center software monitoring and maintenance. Video storage server health monitoring. Operating System (OS) updates and patches. Video Surveillance Center software up-dates and up-grades. This pizza chain franchisee owner with locations in North Dakota and Minnesota chose the Managed Video Data Center solution to record the video from their Little Caesar's locations to a secure centralized location. The company has plans to open 60 locations within 3-years and wanted a solution that could be easily expanded as additional locations are added. A solution was provided to include 2 DSL lines for 9-12 cameras per store. Crucial cameras at each location are recorded in a higher resolution for a more detailed playback. The corporate office will now be able to check on the live streaming and recorded video remotely from any computer connected to the Internet. Store managers are given restricted access to just their store's cameras so they can monitor their own locations. With the Managed Video Surveillance services, the Little Caesar's Pizza franchisee has a flexible, scalable and managed video surveillance solution which eases the responsibility for monitoring and maintain their cameras and provides them with anytime and anywhere remote viewing of the Little Caesar Pizza locations video.